Cheech’s Flugenzombie is a cool articulated baitfish pattern that rides hook up, making it a great choice for fishing along the bottom or in weedy environments. 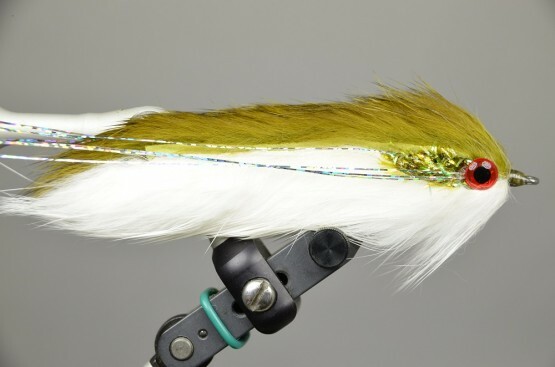 Cheech’s Flugenzombie is a cool articulated baitfish pattern that rides hook up, making it a great choice for fishing along the bottom or in weedy environments. The body is a mix of Aqua Veil Chenille and two different colors of schlappen with a healthy amount of marabou in the mix. The head is finished up with two different colors of Brusier Blend Dubbing and a set of brass dumbbell eyes, and we all agree that the brown and yellow color combination is likely to do some serious damage on the river this year. Cheech’s Flugenzombie is available in size 1.